An Asian Roach looks identical to the German Roach (the most common “indoor” roach) but has the same habitat as the American Roach (the most common “outdoor” roach). Like German Roaches, they are light brown colored with two dark stripes behind the head and approximately 1/2 of an inch long. The Asian Roach lives and breeds outside in mulch, pine straw and other materials used in flower beds to retain moisture, just like the American Roach. This pest is a strong flier and can make its way into structures. This pest may be found in lawns, particularly mulched or composted areas, and will take flight when disturbed. They are attracted to lights, light-colored surfaces and may be seen flying at dusk. Short of a very high powered microscope and dissection the best way to determine if the specimen is German or Asian is to throw it into the air. An Asian Roach will fly and is attracted to light where a German Roach does not fly and prefers the dark. 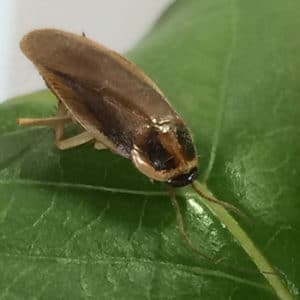 This new species of roach is yet another good reason not to relocate plants from other areas and to maintain mulch levels at not more than two inches.